A notary public is an individual who is bonded, licensed or appointed by a state, who serves as an impartial witness to the signing of key documents. Notaries confirm identity, inspect documents and ensure the signers understand the contents of the documents they are signing. The notary is responsible for ensuring the identity of the people signing important documents, being vigilant that state rules are being followed, and using sound judgment if it appears a person is misrepresenting themselves or otherwise working to undermine the notarization process. Not all "important" forms and documents require notarization. The process is used primarily in instances where an impartial witness is required to ensure the individual signing is who they present themselves to be. 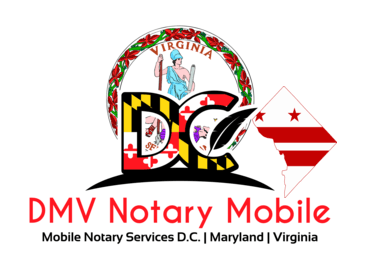 DMV Notary Mobile is a traveling notary service that can come to you at Hospitals and Assisted Living Facilities, Jails, Private Residences, Places of Employment, Lenders Offices, Brokers Offices, Law Firms, Real Estate Offices, Insurance Companies, Title Companies, Escrow Companies, Restaurants, Airports and any other Location of Your Choice. Meet you anytime, anywhere in Washington DC and Maryland - (202) 826-8179 or email here.